Tonight, Nerd Nite Memphis is paying tribute to many nerd’s favorite unofficial holiday – Back to School time! 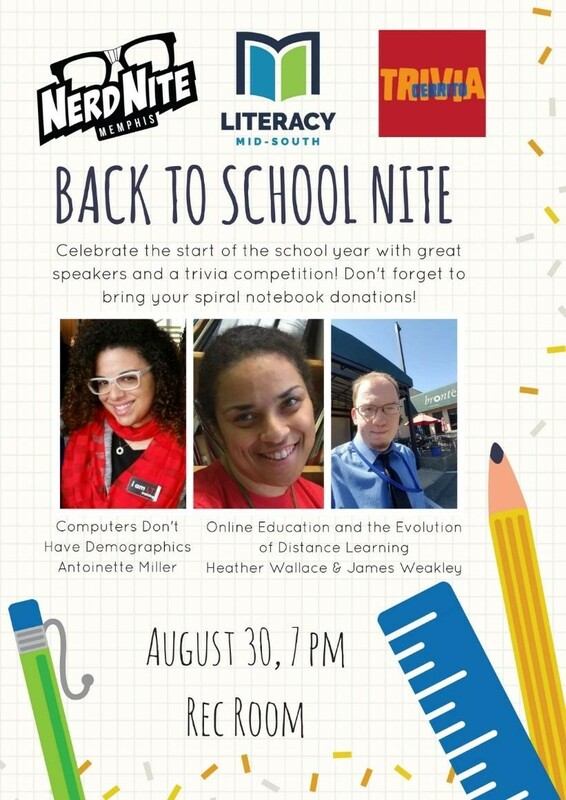 Not only will we have two dynamic education-themed presentations, but we’ll also be partnering with Literacy Mid-South for a spiral notebook drive and Cerrito Trivia for general knowledge trivia to crown the nerdiest nerd! Our first presenter will be Antoinette Miller with her presentation entitled “Computers Don’t Have Demographics.” Ms. Miller’s presentation will explore how you even the playing field when you actively tag yourself as an outsider. For example, how does a black woman, a ‘second chance’ or felon candidate, or a first generation American break into an industry? Although we are dealt different cards, we can choose how we play our hand! Our second presenters for the evening will be Heather Wallace and James Weakley talking about “Online Education and the Evolution of Distance Learning.” Education has expanded beyond the four walls of the traditional classroom, and educational technology is playing an increasingly important role in all levels of learning. With students utilizing everything from apps to webcams to facilitate their education, it is critical that we understand the development and history of the technology involved. Ms. Wallace and Mr. Weakley will explore tech- assisted learning as a byproduct of early distance learning and widespread development of available technology. Between presenters, we will be having game show style trivia contests hosted by Cerrito Trivia. Rec Room will graciously be providing prizes for our winners, and we have brand new Nerd Nite Memphis sticker swag as well! Some come on out, bring your spiral notebooks for Literacy Mid-South, and prepare to celebrate the start of the school year in style! If you can’t make it in person, be sure to follow our live tweets at #NerdNiteMemphis and join our Facebook group!